After months of colder weather and gray skies in many parts of the country, springtime is a welcomed season. It can be especially refreshing for older adults who have spent the winter cooped-up indoors. Fresh air, warmth and sunshine can play an important role in renewing the spirit and enhancing quality of life. Exposure to sunlight and fresh air offers many health benefits – greater energy, reduced stress and improved sleep, to name a few. Fresh air cleans the lungs and helps bring more oxygen to the cells. This increased oxygen in the body translates to greater energy and mental clarity. Spending time in the sun can give a boost of vitamin D through skin absorption – necessary for the brain, bones and muscle function. Sleep schedules can be better regulated by getting some sunlight each morning, which helps the body shut off the snooze-inducing chemical melatonin. And sunlight is thought to help ward off depression, because the “happy” chemical serotonin is higher in the brain during the time of year when days are longer. 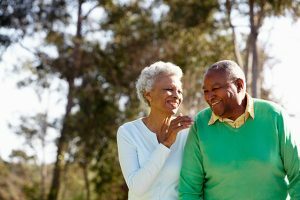 To help older adults welcome spring, we’ve compiled a dozen ideas for outdoor activities that can help rejuvenate mind, body and soul. Take a walk. Studies have shown that even 10 minutes of walking each day can help older adults maintain strength and agility. Many local parks and nature trails have options for people with varying levels of mobility. Or a simple stroll around the neighborhood to take in the scenery can be just the right change of pace. Visit a farmers market. There’s so much to see and sample at a farmer’s market, and the vibrant colors of the produce and smell of fresh flowers are appealing to the senses. Plus, you can take home some fresh veggies for a healthy meal. Check out the National Farmers Market Directory for a location near you. Partake in spring cleaning. A little spring cleaning can create a healthy and comfortable living environment. Open the windows and let the fresh air in! It’s also a perfect opportunity to go through keepsakes and revisit special memories. Go fishing. Dust off your rod and reel and head to your favorite fishing spot. Whether you fish for pure enjoyment and simply “catch-and-release,” or try to reel in some keepers for dinner, fishing is an enjoyable, relaxing pastime. Visit tourist attractions. Be a tourist in your own town! Spring offers the perfect weather for traveling to local landmarks, historical sites and museums. Check with your local visitor center to see what’s happening in your town, and be sure to take advantage of senior discounts. Go on a picnic. A little creativity can turn even the most routine activities into adventures. Try turning your next meal into a picnic. Grab a blanket and head to your favorite park. Bring a book to read or, better yet, bring a friend and share a meal together in the fresh air. Eat outdoors at your favorite restaurant. If a picnic in the park doesn’t appeal to you, how about dinner at a nice restaurant that offers outdoor seating? You’ll get all the perks of dining al fresco, with none of the cooking or cleanup. Add good company, delicious food and ambiance, and you’ve got the recipe for a lovely night out. Install a bird feeder. Once the birds start chirping, you know spring has arrived. An abundant food source will help attract these feathered friends to your yard. Buy a bird feeder (or if you’re handy, build one) and install it near a window. Plant a garden: If you like to get your hands dirty, consider planting a garden. Spring is the right time to start cultivating the earth for herbs, vegetables and flowers. Aside from being able to reap what you sow, gardening is a great form of exercise and can reduce stress. Feel like a kid again: Head outside and do the activities you used to love as a kid! Fly a kite, search for four-leaf clovers or blow bubbles. These are great activities to do with your grandchildren, so invite them over for a playdate and some fun in the sun! Enjoy a sporting event. Whether it’s catching a Major League Baseball game or a grandchild’s soccer match, a sporting event can energize anyone. Attending a game also means time to socialize, which is great for older adults whose social calendars have been limited by ice and snow. Get some exercise. Staying physically active can boost your energy levels, help you maintain your independence and even combat symptoms of illnesses. Exercise doesn’t have to be strenuous; low-impact activities like walking, yoga, swimming and water aerobics can help with flexibility, balance and strength. The National Institute on Aging offers a guide that can help you get started. Enjoy the season with FirstLight. FirstLight caregivers can help older adults enjoy the season outdoors – perhaps a walk in the park, a picnic lunch or help with gardening. In fact, through our ClientFirst matching system, FirstLight Home Care helps match specific caregivers to clients’ interests, habits and routines. Find a location near you to learn more about our services today. For more ideas and tips, follow us on Facebook. Enjoyed your list of suggestions. Especially the Farmer’s Market. One of my elderly Dad’s favorite things to do on the weekend is head over to the Boerne Farmer’s Market with the grand kids and get out of the house. I sent him a the article link. That’s wonderful to hear! Something as simple as a farmer’s market truly can bring joy into the lives of older adults. We hope your dad enjoys the market this season!